If you want to ride like a pro, you should learn from a pro! In Mastering Mountain Bike Skills, Third Edition, world-champion racer Brian Lopes and renowned riding coach Lee McCormack share their elite perspectives, real-life race stories, and their own successful techniques to help riders of all styles and levels build confidence and experience the full exhiliration of the sport. 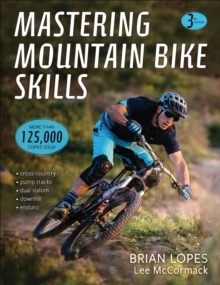 Mastering Mountain Bike Skills is the best-selling guide for all mountain biking disciplines, including enduro, pump track racing, dual slalom, downhill, cross-country, fatbiking, and 24-hour races. It absolutely captures the sport and offers everything you need to maximize performance and excitement on the trail. Learn how to select the proper bike and customize it for your unique riding style. Develop a solid skills base so you can execute techniques with more power and precision. Master the essential techniques to help you carve every corner, nail every jump, and conquer every obstacle in your path. Last, but not least, prepare yourself to handle every type of weather and trail condition that the mountain biking world throws at you. Whether you're a recreational rider looking to rock the trails with friends, are a seasoned enthusiast, or are aspiring to be a top pro, Mastering Mountain Bike Skills will improve your ride and dust the competition. Don't just survive the trail--own the trail, and enjoy the thrill of doing it.